Many adults of a certain age remember the 1978 animated classic Watership Down as a nightmare experience that forever haunts their childhood. Others are devoted to the novel. Now, Netflix and BBC are adapting the timeless tale into a new animated mini-series. And it goes full-blown Game of Thrones, but with rabbits. 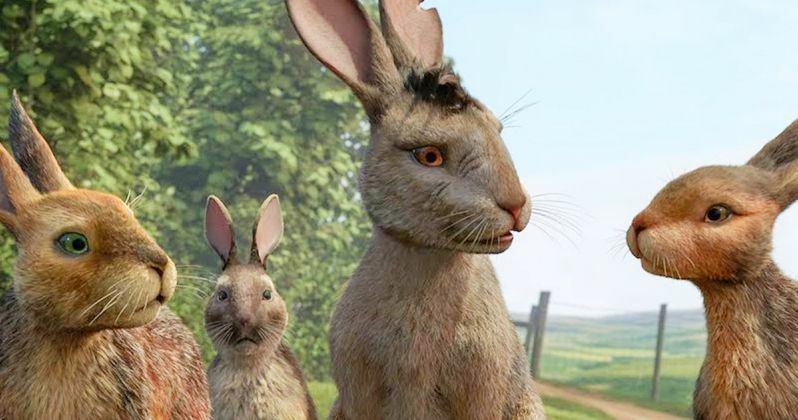 The first trailer for Watership Down has arrived, and it stands close to the original movie while remaining faithful to Richard Adam's novel. This version feels darker in spirit. The tale is all about survival, as a group of rabbits from Southern England receive a deadly vision of the future from Fiver, a psychic seer. Fiver, a character originated by actor Richard Briers in the 1978 version, is played here by X-Men star Nicholas Hoult, who puts his own distinct spin on things. Because of this vision, the other rabbits are forced to flee their seemingly perfect home, and in turn are forced to bunny hop over one disaster after the next, with danger awaiting around every corner. One rabbit brings this ominous warning. "All the world will be your enemy. And when they catch you, they will kill you-but first, they must catch you." This basically equates to the same Game of Thrones mantra of, 'When you play the game of thrones, you win or you die.' It's clear to see that BBC and Netflix are taking a nod from the extremely popular HBO series in making this an updated, enthralling experience for all who feel consumed to binge stream it in one setting. The original novel arrived in 1972, and has not been without controversy. Like the original animated feature, a lot of the U.K.'s finest actors have stepped forward to take on roles in the miniseries. Olivia Colman and Star Wars' John Boyega join other X-Men star James McAvoy and the great Ben Kingsley. Watership Down sails onto Netflix just in time for Christmas. It will first debut on BBC One starting December 22, with it streaming worldwide on Netflix December 23. The original Watership Down left a permenant scar on an entire generation of kids. It's not quite clear if this one will have the same kind of lasting effect. The original was cause for concern, as it arrived with a G rating, only to be filled with terrifying animal violence, and Fiver's psychedelic vision. It was supposed to be an all-ages affair, but turned into a bloody nightmare for some. You can check out the first footage from the TV remake. It comes from BBC's streaming Youtube channel, and opens with modern CGI animation, dripping the audience through one of Fiver's nightmares. It is more photo realistic, which could make it even scarier for any youngsters who settle in thinking they're getting a Christmas treat.